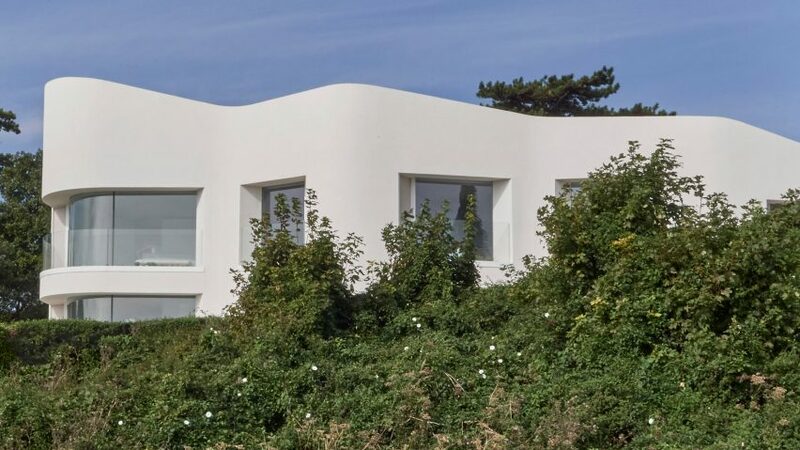 Smooth white walls undulate to create bay windows for this house by British studio Tonkin Liu, which stands on top of Dover's famous white cliffs. 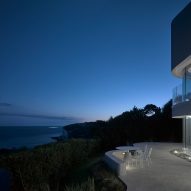 The London-based architects designed Ness Point House for an exposed clifftop site 65 metres above the sea on the southeast coast of England. The crinkled sea-facing facade orients large windows in opposing directions to take in views of various parts of the coastline, including Ness Point, the most easterly part of the British Isles, from which the project takes its name. 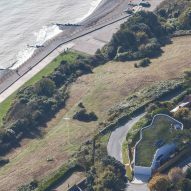 Its bright white walls give the house a stately appearance from its front garden and sea below, a green roof slopes gently down towards a road that passes by the back of the site to diminish its presence. "Ness Point has been designed as if it had grown out of the land in which it is embedded," said the architects. "Hunkered into the land with undulating thick walls along its length, it is constructed as a journey with views that pull the surrounding landscape into the house." "Each room is orientated towards a different aspect of the landscape, across the passing ships of the English Channel, towards the sun rising out of the sea at the winter solstice, and over to the coastal cliffs called Ness Point," they added. 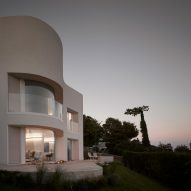 The bright white aesthetic is continued indoors to place emphasis on views out to the gardens and sea, and up to the sky through angled clerestory glazing and an oculus above the bath. The curving walls and skylit spaces lend some rooms a cavernous quality. 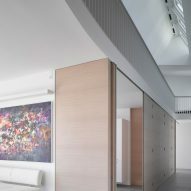 "The interior catches the dynamism of the day's changing light so that the building becomes a part of the larger canvas of ever-changing coastal weather," said the architects. 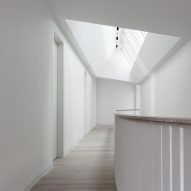 Sequences of rooms are arranged off a corridor that runs along one side of the plan on both the lower and upper floors. 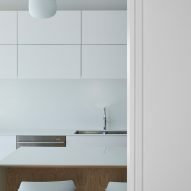 At ground level, a garage is positioned nearest the road at the back of the site, with a kitchen, dining room and lounge placed closer towards the front to appreciate the views. 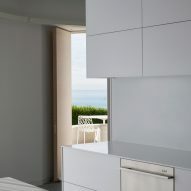 Above, four bedrooms with en-suite bathrooms are arranged in a similarly linear fashion, giving prominence to a master suite facing the sea. 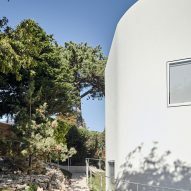 Taking heed of the exposed location and damp conditions, the architects designed the house to be highly sealed and insulated, and gave it a green roof that collects and retains rainwater. 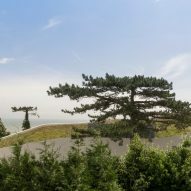 As the green roof matures, it is intended to eventually merge the house with its gardens and the coastal landscape. 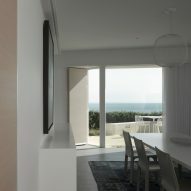 "The castle-like Ness Point House utilises heat recovery and solar thermal renewable systems to maximise energy efficiency in the winter, whilst the long gallery skylight and eco-vents enable passive cooling for equally exposed hot summer sun," added the architects. Mike Tonkin and Anna Liu founded their London practice in 2002. They have since designed a tapering tower complex for the Chinese city of Zhengzhou and several temporary structures, including a flower-shaped pavilion for the London Festival of Architecture in 2008.